Overview: It is a Mumbai based construction contracting firm started in 2012; makes Residential & Commercial buildings in 7-9 major cities. Income and profit were Rs. 1,166 cr. and Rs. 70 cr. (FY17). Operations: It is into the construction of high rise buildings (> 6 floors), super high rise (> 39), villaments and gated communities. It is building the Trump tower in Mumbai. CIP owns tools, technologies and processes that help it deliver with high quality and on time. CIP stands out as an innovative, aggressive building contractor. It has an excellent client base among Property firms. Given this client base and assuming the relationships stay strong, CIP can look at revenues rising at over 30% annually for 3-4 years which will give it a good size, market share and high return ratios. Risks: The major risks are loss of a top 5 client, and project disruption due to labour or other issues. Opinion: The valuations at the IPO price are average, however we are positive due to strong growth potential. This IPO offering is rated BUY, and investors can invest with a 2 year perspective. Here is a note on Capacite Infraprojects Ltd. (CIP) IPO. This IPO opens: 13-15th Sep 2017 with the Price band: Rs. 245-250 per share. Shares offered to public are 1.60 crore at UMP, these are 23.57% of equity. The FV is Rs. 10 and market lot is 60. The IPO will collect Rs 400 cr. by fresh issue of shares. There is no OFS by holders. The promoter group owns 57.2% in CIP while Paragon Partners, Infina and New Quest own 30.7%. Paragon Partners is backed by Siddharth Parekh, the son of Deepak Parekh, the chairman of HDFC. The promoter group holding will reduce to 43.7% (Post-IPO) which is low, see Fig 3. CIP benefits as it is a fresh issue and the proceeds will go to it. See utilization proceeds in Exhibit 1. The unofficial/ grey market premium for this IPO is Rs.110/share. This is a positive. CIP is a Mumbai based construction firm focused on Residential and Commercial buildings. Total income for FY17 was Rs. 1,166 cr. and net profit Rs. 70 cr. It has 1,711 full time employees and 10,035 contract workmen across all projects (May ‘17). They provide end-to-end construction services for residential buildings, multi-level car parks, corporate offices, commercial buildings and for educational, hospitality and healthcare. CIP is into the construction of villaments, gated communities, high rise buildings (> 6 floors) and super high rise buildings (> 39 floors). They operate in the Mumbai, NCR, Bengaluru, Pune, Patna, Chennai, Hyderabad, Kochi and Vijaywada, and projects in the West, North and South Zones constituted, 58.9%, 14.2% and 26.7% of total projects, resp. See Fig 2. CIP works for reputed clients and are associated with marquee construction projects such as Trump Towers Mumbai. Clients include Kalpataru, Oberoi Constructions, Wadhwa Group, Saifee Burhani Upliftment Trust, Lodha Group, Rustomjee, Godrej Properties, Brigade Enterprises and Prestige. CIP had an order book of Rs. 4,602 cr. (May 2017). CIP majorly operates in residential projects space. The order book breakup by project purpose and by project type is in Fig 4 and Fig 5. CIP has received an ISO 9001:2008 certification for their quality management system. They have also received an ISO 14001:2004 for environmental management system and an OHSAS 18001:2007 in respect of their occupational health and safety management systems. Leadership is Deepak Mitra (Ch’man & Director), Rohit Katyal (ED & CFO) and Rahul Katyal (MD). CIP has a hub-and-spoke model, with 3 zonal hubs located at Mumbai, NCR and Bengaluru. CIP believes in owning equipment that is required throughout the lifetime of a project, that is, formwork, tower cranes, passenger and material hoists, concrete pumps and boom placers (their core assets) as this allows them to have timely access to key equipment. CIP uses specialised formwork tech., including vertical composite panel system for columns, horizontal composite panel system for slabs, crane enabled composite table formwork, aluminium panel formwork and automatic climbing system formwork. The modern formwork technologies help reduce the construction cycle time of replicating floors in a highrise construction compared to conventional formwork systems, such as cup-lock formwork. CIP have the capabilities to undertake building construction projects using modern tech. including temperature-controlled concrete for mass pours, self-compacting free flow concrete for heavily reinforced pours and special concrete for vertical pumping in Super High Rise / High Rise Buildings. The order book was Rs. 4,602 cr. in May 2017. CIP obtained orders worth Rs. 1,500 cr. from real estate developers like Oberoi, Wadhwa, Rustomjee and Kalpataru in Mumbai, Emaar in Gurgaon and Ozone in Bengaluru after the demonetisation in Nov 2016, an achievement in a tough economy. In addition, CIP received orders worth Rs. 305 cr. as sub-contractors for erecting the Trump Towers in Mumbai’s Lower Parel and 2 orders from Radius Developer worth Rs. 300 cr. in Aug 2017. CIP plans to expand its business operations to Ahmedabad in 2-3 quarters. New Quest, Infina, Paragon and JT HUF invested Rs. 60 cr. in CIP in 2017. They were issued 6,49,332 compulsorily convertible preference shares of FV Rs. 20 each. CIP received the ‘Achievement Award for Construction Health, Safety & Environment’ at the 9th Construction Industry Dev. Council Vishwakarma Awards 2017 for 3 of its ongoing projects. It got the ‘Emerging Construction Company of the Year’ award at the Construction Times Builders Award 2017. Promoter profiles: Mr. Rahul Katyal (age 42) has 16+ years experience in business development. He has been a Director of CIP since Sept 1, 2012. He focuses on Sales and Operations. Mr Rohit Katyal (age 46) has held roles of CFO and ED at CIP since Mar 1, 2014. He has 25 years of experience. He is a BCom from Podar College. Both are brothers. Both had senior/ director level positions in Pratibha Industries Ltd. before CIP. The Real estate sector plays a crucial role in the Indian economy, contributing to 5-6% of the country’s GDP. It is the second largest employment generating sector after agriculture. Apart from generating direct employment it also stimulates demand in over 250 ancillary industries such as cement, steel, paint, brick, building materials, furniture, consumer durables, fittings, etc. India’s construction industry is expected to log materially faster growth, fuelled by spends in road, irrigation, rail and urban infra projects over 2016-21. Spending in the period is expected to be Rs. 23-24 tn., translating into a CAGR of 10-12%, way faster than a 2-4% rate observed between 2012-15, when an economic slowdown and attendant sluggish demand had stalled India’s investment cycle. Over 5 years, infrastructure projects will provide construction demand of 92% of overall construction spend, owing to the govt. focus on roads, urban infrastructure and railways. Demonetization may have limited impact on construction as such transactions are cashless. In India, urban housing stock was about 8.9 cr. units and rural stock was 17.9 cr. units as of 2015. It is estimated that the growth in rural housing stock will be at 1.7%-1.9% CAGR of over 2016-19, as compared to a 2-4% CAGR for urban housing over the same period. (Source – CRISIL from RHP). The major competitors of CIP are L&T Construction, Shapoorji Pallonji Construction, Simplex Infrastructures, JMC Projects, and Ahluwalia Contracts. Competition from multinational companies is primarily from Leighton India Contractors, Samsung E&C India and Eversendai Construction. CIP Revenues, EBITDA and PAT have grown at 75.2%, 114% and 157% resp. 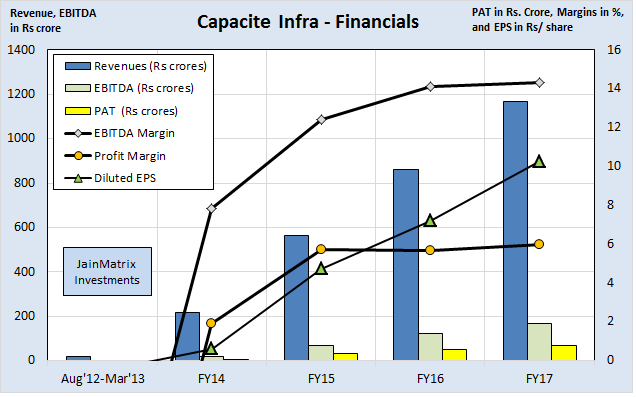 CAGR in FY14-17, Fig 6. CIP has a ROE of 23.15% and ROCE of 24.15% for FY17 which is excellent. CIP has moderate margins which have been stable over 3 years. The D/E was 0.51 in FY17 which is moderate, but has improved from 2.02 times (FY15). The EPS has risen in the last few years, Fig 6. On May 2017, CIP had an order book of Rs. 4,602 cr. This gives 3.9 years of revenue visibility at the FY17 run rate. This is a positive. In practice, CIP must accelerate growth to deliver on OB. CIP had declared a dividend of 20% in FY16; but no dividend was declared for FY17. CIP had positive cash from operations in 4 of 5 years, and has made investments steadily. 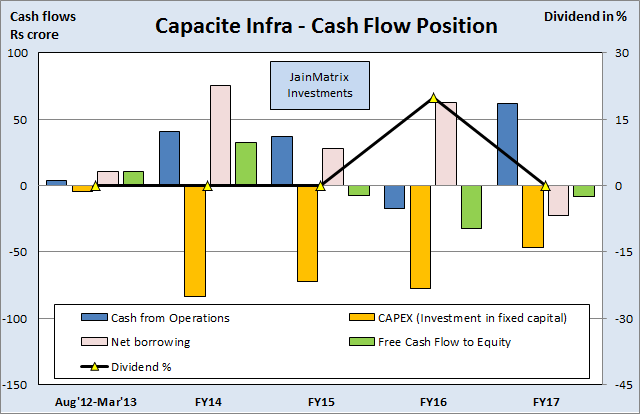 CIP had positive FCFE in only 2 out the last 5 years, due to debt reduction as well as CAPEX. Fig 7. Management has indicated a 60-90 days’ worth of account receivables on ongoing projects. That is about Rs 291 cr. based on FY17 revenues. Debt is low in comparison at about Rs 120 cr. We benchmark CIP against peers, both construction contractors and developers. See Exhibit 8. The FY17 based PE for CIP appears moderate. However the high growth rates make the valuations look attractive for a 2 year holding period. The P/B ratio of CIP at 2.37 times is fair. CIP has excellent Sales and PAT growth compared to peers over 4 years. This is a positive. The D/E ratio at 0.51 is moderate. This has fallen from over 2 times in FY15. So growth has been with improving financials. This may also have come from funds raised from PE investors. Margins are high among the Contractor pack. The RoE at 23.15% makes CIP a leader in this parameter. A lot of other real estate players have low or negative return ratios due to a variety of industry wide challenges. The inventory turnover ratio, fixed assets turnover ratio and margins are average among peers. The rise and rise of CIP is due to the success of promoter brothers, Rohit Katyal and Rahul Katyal. With rich work experience from Pratibha Industries, they set up CIP together. They also handle different portfolios – Rahul as MD handles Sales and Operations and Rohit is CFO. CIP has a good reputation of doing quality work in a timely fashion, which is delivered by using its proprietary tools and technologies which bring down the construction cycle time. CIP has an exclusive focus on construction of buildings in major cities. The geographical spread of their projects has been limited to major cities in India, with a focus on Mumbai, NCR and Bengaluru. CIP has a marquee client base and a large order book at 3.9 times revenues in May 2017. They have secured repeat orders from some of their clients, like the Lodha Group, The Wadhwa Group, Godrej Properties, Transcon Developers, Ahuja Constructions and Puravankara Projects. In fact clients have taken them to new geographies outside Mumbai, and helped in their growth. CIP has a strong track record of growth and profitability. They have reduced debt over 2 years. The asking P/E at 24 times is moderate. CIP has low debt and a sustainable business model. The IPO is a fresh issue of shares. Hence the promoters aren’t cashing out which is a positive. CIP has risen to today’s strengths in less than 5 years of operations. This sounds incredible, in such a high competition business. However we have found that that the promoters had many years of work experience in a related business (Pratibha Industries) before starting CIP. A revenue growth of 30-50% may be required to sustain high RoE for CIP. The high RoE of CIP is explained by high revenue growth of the firm. Margins are in average range and cannot rise sharply for a construction contractor. On time delivery is a given. To continue this high performance, CIP will need to continue growing at a fast clip, in the chosen high growth cities. The brother promoter relationship must stay strong, for CIP to flourish. To continue its success, CIP’s senior management team will also need to scale up. Client concentration – projects awarded by their top 5 clients represented 38.7%, and top 10 clients have 59.7% of their Order Book, as of May 2017. This is a risk. However conversely we can say that if relationships stay strong, these solid customers can power future growth. Promoters have diluted 43% of CIP pre IPO. This is not worrying as they retain 44% post IPO. Typical Industry risks include 1) manpower shortage issues. 2) Liability claims or claims for damages or termination of contracts with clients for failure to meet project milestones or defective work issues. 3) fluctuating prices of steel, sand and ready-mix concrete. 4) Clients operate in a highly regulated environment, and existing and new laws, regulations and govt. policies can affect the sector. 5) Construction involves physical hazards and risks. 6) A competitive market, CIP must bid for and continue to win construction projects. Construction sector is massive in India and likely to witness a revival from increased demand from real estate and infrastructure projects, govt. initiatives and funding and private sector investments. In this massive sector with numerous players and high competition, CIP stands out as an innovative, aggressive building contractor which brings in technologies and processes that helps it deliver with high quality and on time delivery. It has an excellent client base among Property firms. CIP has a professional management team, a reputed PE backing and clear growth strategies which are likely to take the company to new heights in the near future. Given this client base and assuming relationships stay strong, CIP can look at revenues growth over 30% p.a. for 3-4 years which will give it a good size, market share and high return ratios. Major risks are loss of any top 5 client, and project disruptions due to labour or other issues. The valuations at the IPO price are average, however we are positive due to strong growth potential. This IPO offering is rated BUY, and investors can invest with a 2 year perspective. This document has been prepared by JainMatrix Investments Bangalore (JM), and is meant for use by the recipient only as information and is not for circulation. This document is not to be reported or copied or made available to others without prior permission of JM. It should not be considered or taken as an offer to sell or a solicitation to buy or sell any security. The information contained in this report has been obtained from sources that are considered to be reliable. However, JM has not independently verified the accuracy or completeness of the same. JM has no known financial interests in Capacite Infraprojects Ltd. or any group company. Neither JM nor any of its affiliates, its directors or its employees accepts any responsibility of whatsoever nature for the information, statements and opinion given, made available or expressed herein or for any omission therein. Recipients of this report should be aware that past performance is not necessarily a guide to future performance and value of investments can go down as well. The suitability or otherwise of any investments will depend upon the recipient’s particular circumstances and, in case of doubt, advice should be sought from an Investment Advisor. Punit Jain is a registered Research Analyst under SEBI (Research Analysts) Regulations, 2014. JM has been publishing equity research reports since Nov 2012. Any questions should be directed to the director of JainMatrix Investments at punit.jain@jainmatrix.com.